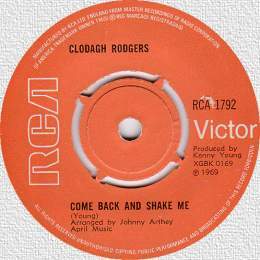 Clodagh Rodgers is now best remembered for her big 1971 hit, 'Jack In The Box' which was the UK's Eurovision Song Contest entry for that year. The song didn't win, but it became a massively popular recording despite that. 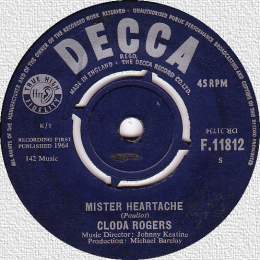 Clodagh's singing career started about a decade before and her first recordings (as Cloda Rogers- see below) were made during the early 1960s. Clodagh's first record releases did not sell well enough to chart though she gradually became familiar to British audiences through her Film and TV work. However, the change of decade saw her at the peak of her singing career and her singles were selling as well as any other British female vocalist. She would have three more chart hits during the 1970s including her splendid smash- 'Jack In The Box'. She continued to be a popular performer with regular TV appearances, but her singles began to fade as the new decade progressed and her later recorded work is now best represented by albums. Clodagh ultimately withdrew from the show business scene- presumably because of family commitments. She has now returned to both acting and singing and continues to perform regularly though at a more relaxed pace than in 1970.